Passengers board an intercity bus on East Broadway. CHINATOWN — Illegal long-distance buses that stop in Chinatown could soon face thousands of dollars in fines. The NYPD and the Department of Transportation will begin enforcing the city's rules for intercity bus by Aug. 15, according to elected officials who met with the agencies this week. The regulations, which went into effect last summer, allow the city to fine buses for operating without permits, stopping outside of approved zones or deviating from schedules. Fines start at $500 and climb to $2,500 for subsequent offenses within two years, according to the DOT’s website. "This is an important step to improving the quality of life of Chinatown and Lower East Side residents," state Sen. Daniel Squadron, Assembly Speaker Sheldon Silver, Councilwoman Margaret Chin and Borough President Gale Brewer said in a joint statement. The NYPD will be the lead agency in charge of issuing fines to companies that break the rules, a DOT spokesman said. The DOT referred all further enforcement questions to the NYPD, which did not respond to requests for comment. Last year, the city began requiring all long-distance buses — which travel to destinations as far away as Ohio, Virginia and Florida — to have a permit to drop off or pick up passengers in New York City. Since then, dozens of companies have received permission to do so. But Chinatown residents and business owners complain that buses from companies without permits still clog the curbs, adding to neighborhood traffic and pollution. Michelle Myles, owner of Dare Devil Tattoo on 141 Division St., said she has long been frustrated by a bus without a permit that stops outside her tattoo parlor, flooding the shop with passengers who ask to use the bathroom. "That’s great," she said of the planned enforcement push. "It's about time." To give bus companies time to learn about the changes, enforcement did not begin immediately after the rules went into effect last summer, officials said. But that grace period is over. By Aug. 15, bus operators will be fined for offenses that include operating without a permit, using buses without proper identifying markings, failing to display a copy of the permit and idling at an approved stop. The DOT is working with the city's 311 system to ensure that police are alerted to all complaints about illegal bus operations, officials said. Some bus company officials said they welcome the enforcement effort. Darryl Days, operations manager for YO! 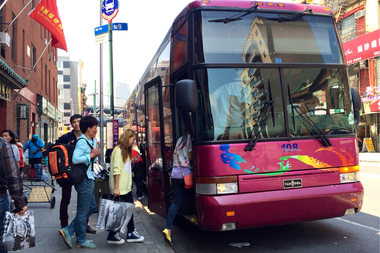 Bus, which stops in Chinatown, said it could improve companies' relationship with residents. "I would like to think as you get more companies that are properly registered down there, customers will feel safer and people in the community will feel more comfortable," he said.